Who says you can't have it all? 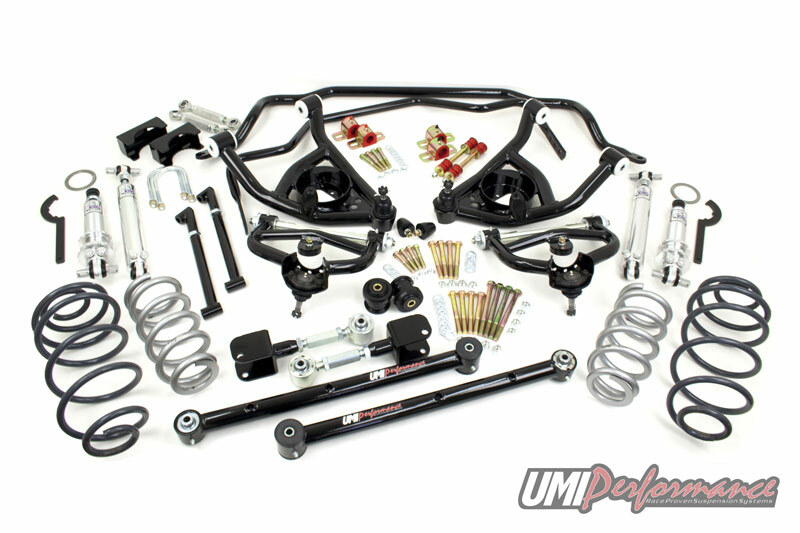 UMI's Stage 4 kit transforms your G-body into a handling machine with the adjustability to perform well at the strip or haul your family comfortably - to the autocross. If drag racing is more your style, a few minor changes at initial purchase (or down the road) will have you launching with the best of them, then canyon carving on the way home! 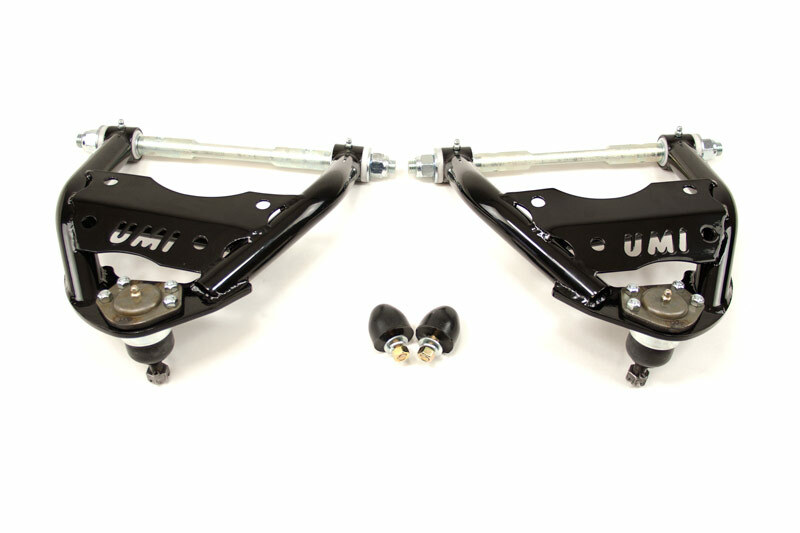 Up front we start with UMI's proven upper and lower tubular a-arms loaded with ½” taller upper and lower ball joints. The upper a-arms increase caster, without additional shims, for a precise steering feel. The lower a-arms are loaded with UMI-built Delrin bushings for smooth non-binding motion and precise steering. Viking's new front hybrid coilover with double adjustable shock allows ride height, compression and rebound adjustment. The ride height adjustment is accomplished with the included spanner wrenches and thrust washers. The compression and rebound adjusters are clicked by hand (no tools!) and feature a total of 361 possible valving combinations. 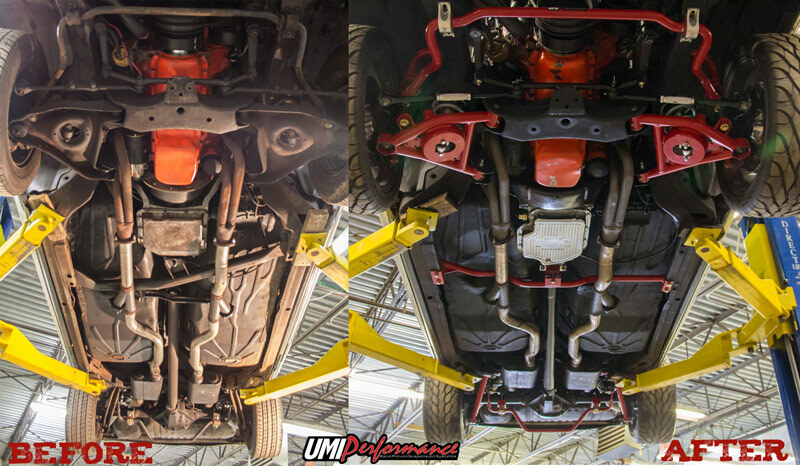 The front is completed by UMI’s 1.250” chromoly handling sway bar. Out back we stiffen the chassis with adjustable tubular frame braces which stabilize the Poly/Roto combo lower trailing arms and fully adjustable Roto-Joint upper control arms. 1” or 2” lowering rear springs are controlled by Viking’s double adjustable rear shocks, once again featuring 361 possible combinations. Rounding out the rear is our Pro-Tour style rear sway bar. This 3-way adjustable bar features 1” tubular construction, race style end links and UMI’s proven CNC machined clamping system. One bar allows street, road race, auto-x and drag settings. As always, this kit features UMI’s quality red or black powder coat and premium hardware. All UMI components are manufactured with pride in Philipsburg, PA – USA. Save $200.00 when purchasing these items as a kit! Increased spindle height by 1” via tall upper and lower ball joints for improved camber gain and a better contact patch. Upper a-arms add caster for improved steering feel and straight line stability. 1.250” front sway bar for flat cornering, CNC bent from 4140. Double adjustable Viking shocks are hand assembled in Minnesota USA and feature 361 possible valving combinations. Simply click and tune. Rear trailing arms feature Poly and Roto-Joints as well as adjustable uppers for setting pinion angle and rear lateral location. Roto-Joints allow smooth articulation for improved handling and less bind. 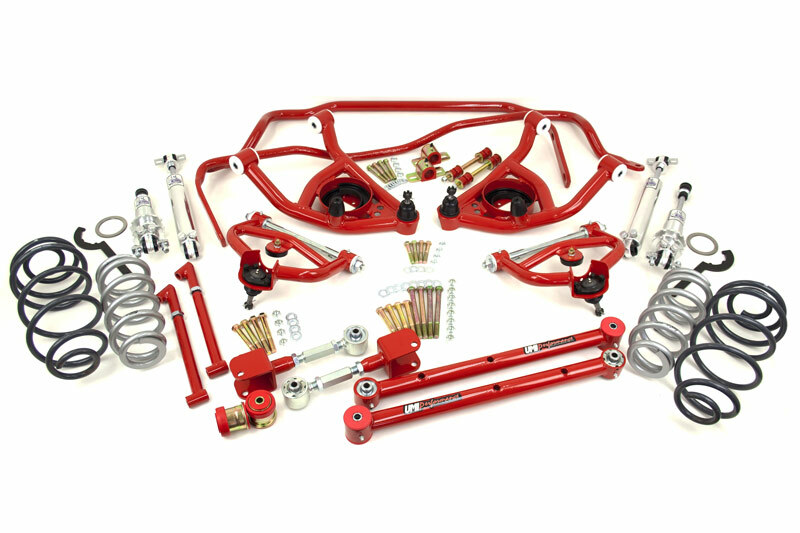 Choice of 1” or 2” rear lowering springs combined with Viking double adjustable rear shocks works great on street, auto-x and even the drag strip. 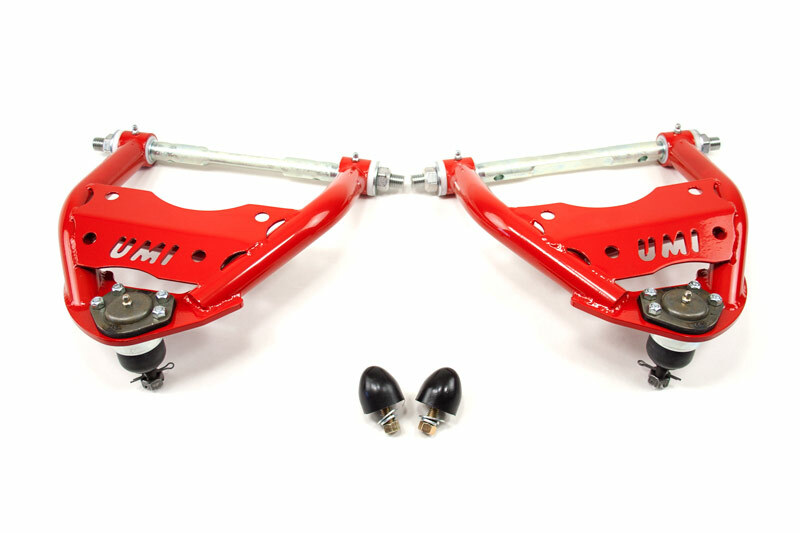 1” diameter tubular Pro-Tour style rear sway bar allows setting for street/handling or strip. Chassis mounted sway bar allows 3 adjustments. Rear sway bar is preload adjustable to function as a drag anti-roll bar. Simply turn the on-car adjuster and leave the line with no body twist and even traction. Premium hardware included. Bolt on and go. Manufactured in Philipsburg, PA – USA by workers who care about your car.